Yosemite Miwok Indian basket makers or Mono Lake Paiute basket makers in Yosemite? What we are going to do is examine the information of one particular well known basket making family in Yosemite, who are really Paiutes from Mono Lake and how many writers started to add “Yosemite Miwok” to all their stories and books. Yet the majority of the baskets were done by Yosemite-Mono Lake Paiutes. Yosemite-Mono Lake Paiute basket makers at Yosemite Indian Field Days basket competition 1925. Most of the winners were Mono Lake Paiutes. From Left to Right: Tina Charlie, Carrie Bethel, Alice Wilson, Leanna Tom and Maggie “Taboose” Howard – Mono Indians with Chief Ranger Townsley. So let’s look at this site. This one really had bad information. Lucy Parker’s maiden name was Tom, she was Lucy Tom. Lucy Tom’s father was full blooded Yosemite-Mono Lake Paiute Bridgeport Tom and her mother full blooded Yosemite-Mono Lake Paiute Louisa Sam-Tom. Lucy Tom’s mother’s grandparents were full blooded Yosemite-Mono Lake Paiute Captain Sam and his wife Susie Sam who died on August 1903. Captain Sam at June Lake located in Mono County where he spent the majority of his life. 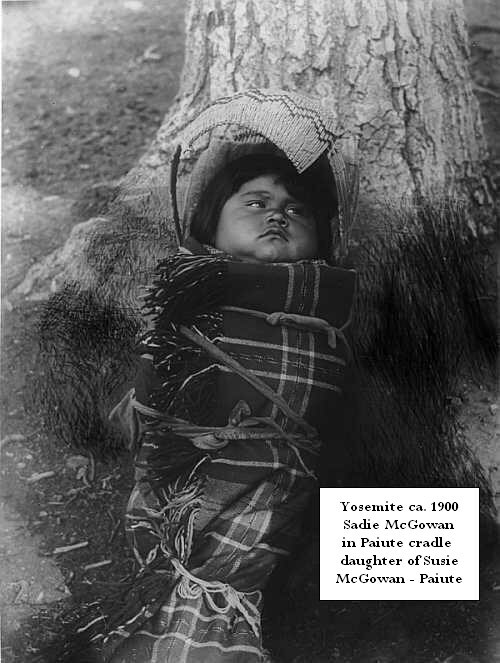 Full blooded Paiute Captain Sam spent half year in Yosemite and the rest of the year in Mono County. He was a famous guide and fisherman for the local Yosemite hotels. This is the second page of Captain Sam’s application stating he is full blooded Paiute and so is his wife Susie Sam. Local Miwok-Paiutes?…no Mono Lake Paiutes and a western Mono, Numic people, not one of those mentioned, Carrie Bethel, Minnie Mike or Ida Bishop were Miwoks, but Mono and Mono Lake Paiutes. In fact there were no Miwok basket makers in Yosemite during that time. Then let’s look at this site. Note in this quote in the second sentence Paiute is last as the identification of Julia Parker’s husband’s tribe. Here is LLoyd Parker’s 1929 application stating he is Paiute. 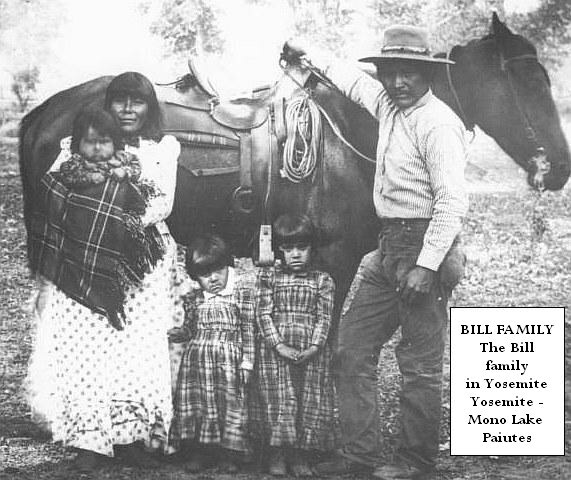 Lloyd Parker is the father of Ralph Parker, Julia’s “Yosemite Miwok” husband. 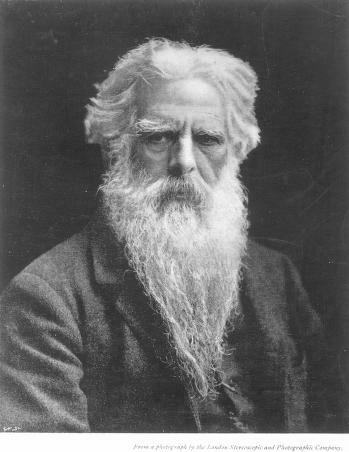 Note he is a “Piute – from Mono County”. Once again “Local Miwok-Paiutes”?…no Mono Lake Paiutes and a western Mono, Numic people, not one of those mentioned, Carrie Bethel, Minnie Mike or Ida Bishop were Miwoks, but Mono and Mono Lake Paiutes. In fact there were no Miwok basket makers in Yosemite during that time. “Born 1902, near Mono Lake. A Piute. His father was Jack Parker, his mother Lucy Tom. His wife was Virginia Murphy, of Mono Lake. They had three sons. Ralph lives and works in Yosemite for the Road Department. Clarence died about three years ago in an automobile accident. Kenneth lives in Bootjack; near Mariposa; his wife is Dorothy Bolton and they have three children. Let’s look at Yosemite Ranger Bingaman’s book. Bingaman writes that Lloyd Parker is a Paiute from Mono Lake and not a Yosemite Miwok. 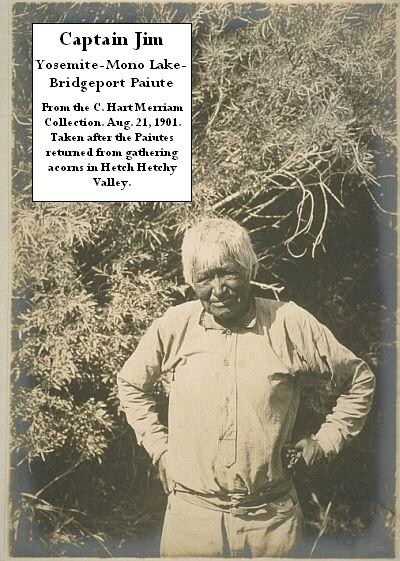 His wife Virgina Murphy is a Paiute from Mono Lake and not a Yosemite Miwok. So how is their son a Yosemite Miwok? In Tradition and Innovation, Craig D. Bates and Martha Lee, a supposed book of the basketry of the Yosemite – Mono Lake area, the book barely mentions the real baskets makers families, the Murphys, Stevens, Harrisons, James, McBrides, and other Paiutes, instead it focused on several supposed Miwoks, who by the way were really Yokuts, as basket makers and of those women several where not known to make baskets at all, but their descendants are going for federal recognition as “Yosemite Miwoks”. Photo of the Yosemite Indian Fields Days basket competition held NOT in Yosemite Valley, but at Paiute June Lake, in Mono County, where the Mono Lake Paiutes lived. Featured in the photo is Maggie “Taboose” Howard and Tina Jim – Charlie, Mono Lake Paiutes. 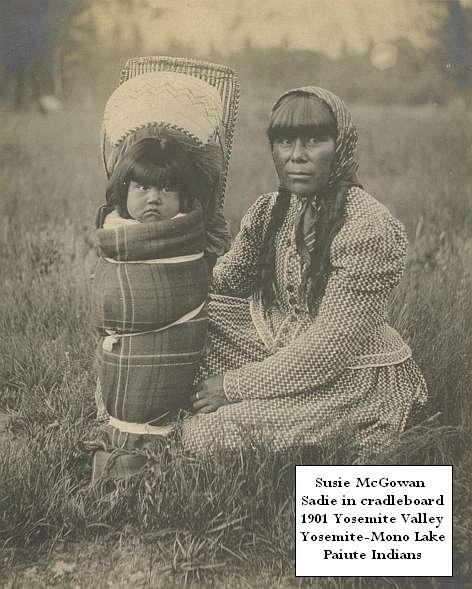 So my Paiute people, the next time you see that the “traditions of the Yosemite Miwok basketmaking is still being carried on” on the internet and in books, remember it was really the basketry tradition of the Yosemite-Mono Lake Paiute Indian people, no matter what some of these people tell you.